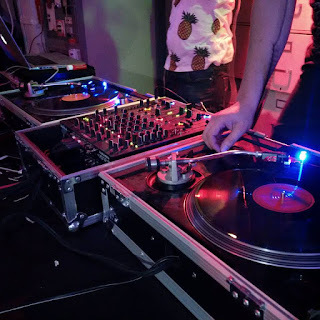 Just ahead of Record Store Day, I was passing some record stores in Normal, Illinois (the current location of the INBA convention), and was thinking about when radio stations used to play vinyl, and club DJs spun only vinyl as well. Which prompted me to write about some sleuthing I've been doing about the Radio Biz. 21st-century DJ spinning vinyl at a crazy party I went to near Chinatown, which I will go to again, but can't say anything online about it until after the fact. Have you ever worked at a radio/media company, where the local official refers to "Corporate," as in, "We need to check with Corporate about that," or "Corporate says..." or "Corporate has decided to..." etc., and you wonder just who "Corporate" is? Well, sometimes the highest levels of Corporate like to reward themselves, but the details of their self-celebratory practices are murky and swirling in rumors rather than fact. But thanks to the U.S. government, Corporate's activities are documented, making it easy to find out just how much they approve of themselves and some others, such as the ones who sit on their boards and get a big enough chunk of change to equal more than what most part-time or per-diem contractors make in probably a decade. For instance, the Entercom boss makes a base salary of over a million dollars (which seems like a pittance compared to the Tribune boss, who "is entitled to a monthly payment of $200,000" and can get "an annual bonus up to $6,000,000"), and folks on the Entercom board make $80,000 in addition to stock configurations (though not as robust as the boss and sub-bosses). But some folks say they deserve it, because executives and board members of companies that have "hit a five-year low" and "saw its stock fall by 30 percent" should get paid well, right? You might be thinking, "These are all numbers...what does an actual 'Employment Agreement' look like, such as one that promises 'an annualized salary of $450,000' and a 'three percent' raise each year, in addition to incentives?" Well here one is, in the SEC archives. 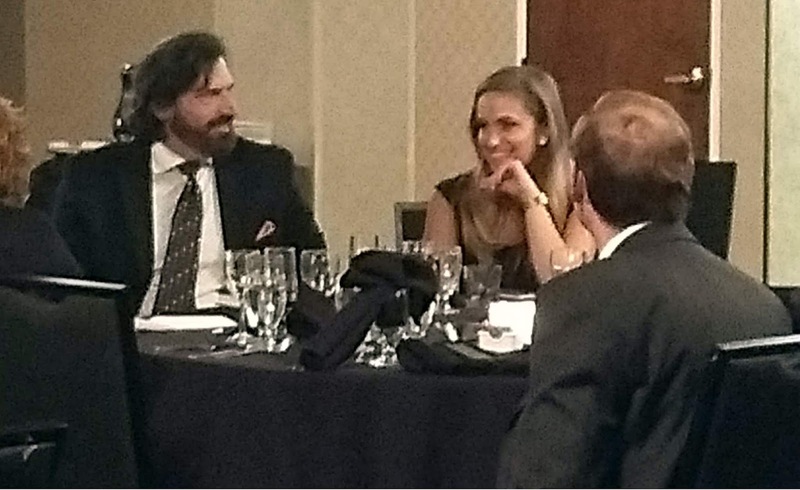 It's between Andrew Sutor, Senior Vice President and General Counsel, and "Entercom Communications Corp."
Now you're probably thinking, "I don't work for Entercom, who cares what this guy makes." In that case, you can go to the Securities and Exchange Commission's website and do a search for any company you want. You'll see a bunch of filings, but don't be intimidated. Find the corporation's "DEF 14A" form, which is a proxy statement, and find out how much your "Corporate" bosses make, and what's in store for them if they convince the board that they're performing admirably. I've already done a search of various companies, and it's easy. No need to wait for articles to come out...you can do it yourself...have fun! Today I made the 25-mile trek from my downtown digs to the burbs to gather with a hundred presumably suburban people to celebrate the 60th radio anniversary of Ken Alexander, who's part of the Those Were the Days show, which can be heard every Saturday on WDCB (which became infamous at one point for employing a thief, housed within the reportedly corrupt College of DuPage, which made the City Colleges of Chicago seem relatively clean). 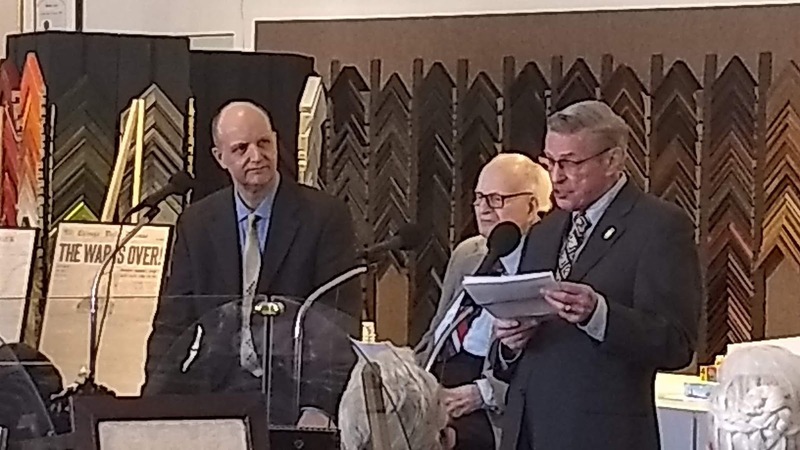 The celebration was at The Framemakers in Westmont, which sponsors the show (a shameless plug because it's incredible that they support old-school radio endeavors). though I don't know if current TWTD host Steve Darnall (left) agrees. Mr. Alexander (don't know if I'm allowed to refer to him as "Ken," since he's an elder statesman and I have never met the guy) told his radio story, which includes the following that I scribed on my phone while "Those Were The Days" creator Chuck Schaden told us that Mr. A doesn't have any type of portable phone, thus making this means of reporting ironic. In 1947, Mr. Alexander graduated from from Austin High School on Chicago's west side (which is probably way different now than when he went there). He didn't go to college because he had to work (which I think was typical of those times, thanks to a more forgiving, booming post-war economy). He was told about a radio job as an errand boy at WGN, and he went for an interview and thought he had a good chance of getting it. But alas, just like today, it was about who you knew, and he was predictably told that it was given to a relative of someone who was already working there (gotta love nepotism...and I wonder what ended up happening to that lucky lad). Ken Alexander reading an old-school radio story that was featured on the show. And in case you didn't know, the war is over! With his radio dream sidelined, he needed to make a living elsewhere, so he worked in the railroad biz from 1948-1957. He quit that demanding job (I'm not being sarcastic...it really was demanding, according to him) to work at Musicraft on Oak Street near Michigan Avenue (i.e., the Gold Coast...as if you need clarification). 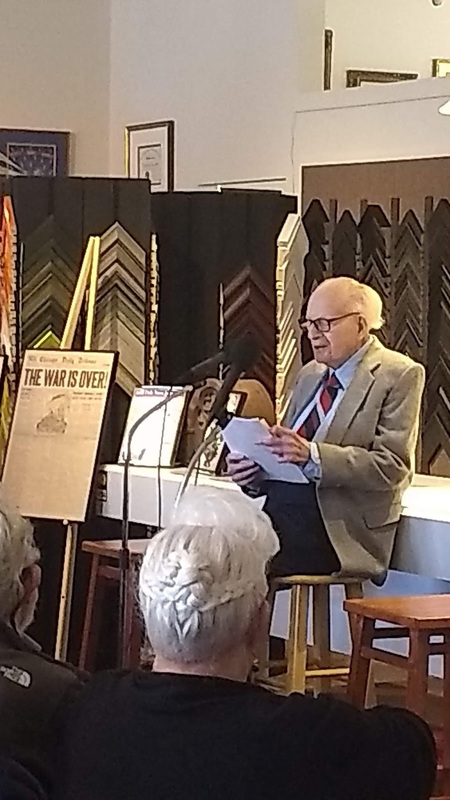 Then in 1959, he got a chance to broadcast from the Edgewater Beach Hotel on WEBH as a Sunday volunteer after the owner, Buddy Black (who was previously at WGN), heard his demo. Radio geekery that Mr. A shared: Amos and Andy kick-started their radio career at WEBH in the 1920s. Ken Alexander (very far left) making the rounds before the event. 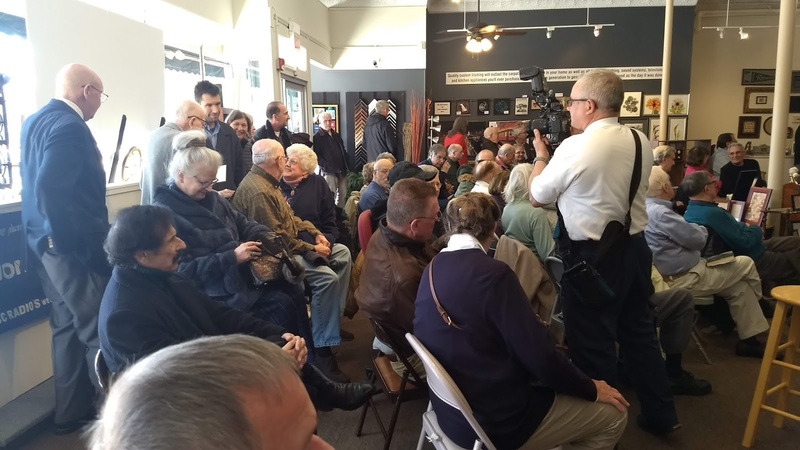 The Framemakers (celebrating their 50th year) ended up bursting with standing-room only. Note the pro photographer...his pics will be way better than mine. He eventually got paid when they got rid of the volunteers, and he played his own classical music records on the air. Then the owner of WNIB, Bill Florian, wanted to hire him, though there were no openings because FM stations didn't have much money in the 1950s (as if there's any money now). More radio geekery shared by Mr. A: Bill Plante, who became a major CBS TV news guy, did announcing at WNIB while he was on his way to major national news success. When Bill (don't know the guy but I'll use his first name anyway) left to do news elsewhere, Mr. A eventually replaced him. At that point, he was working at the Gold Coast store, WEBH, and WNIB at the same time. 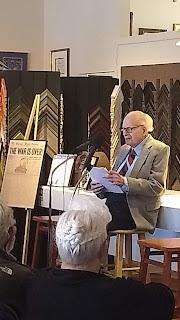 Eventually he gave up the store and initially held on to WNIB while getting an opportunity at WAIT in the early 1960s. 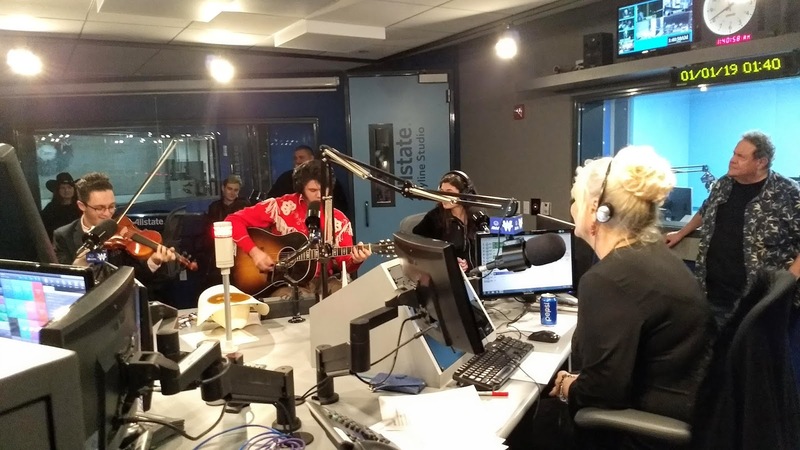 He said he scored that sweet gig because he had a good demo; unlike the out-of-towners, he understood WAIT's style because he lived in Chicago. He quit WNIB when he got a normal job at WAIT, which even included overtime (imagine that, you underpaid radio folks). He started at WAIT in 1964 and left about 22 years later, in 1986 after the situation became more volatile. Some nostalgic items from Chuck Schaden's collection sharing space with Nostalgia Digest, which is also now a podcast! It was interesting timing, because the station was sold a few months later for a mere half-million (while the Florians banked 165 million bucks for WNIB in 2001). Then he joined Chuck Scheiden's "Those Were the Days" show after that, as permanent guest host. His radio career continued in the 1990s when he went back to WNIB as a fill-in for announcers. So far, he's been with "Those Were the Days" for over 30 years. More radio nostalgia from Chuck Schaden's home...sorry to the man who I had to squeeze by to shoot this. 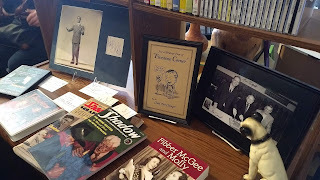 And note the picture of Darnall, Alexander, and Schaden near Nipper, of "His Master's Voice" fame. Or he could just be a dog. 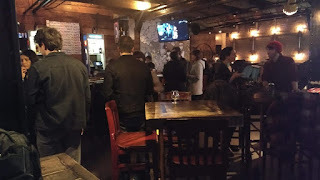 After sharing his radio story, he took questions from the large audience, but I had to get back downtown for my own radio gig, so I couldn't stay in Westmont (which is a lovely burb...check out their downtown...worth the trip, easy by car or Metra). 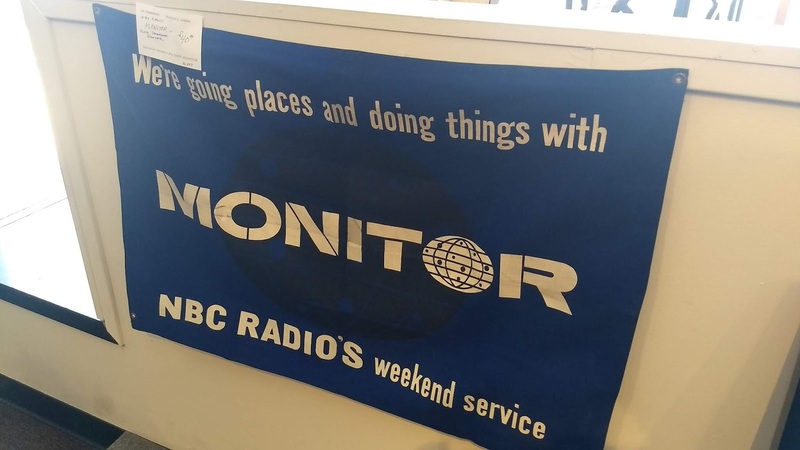 Have you been listening to NBC Radio's Monitor this weekend? It's been a couple years since I first passive-aggressively complained about the Writers Guild of America East (WGA), which is the east-coast version of the Writers Guild of America West (the seemingly more trendy version, where Conan O'Brien and other Hollywood heavyweights grew beards or whatever as the WGA West went on strike and got lots of attention and forced multimillionaire talent to, *gasp*, write their own stuff). 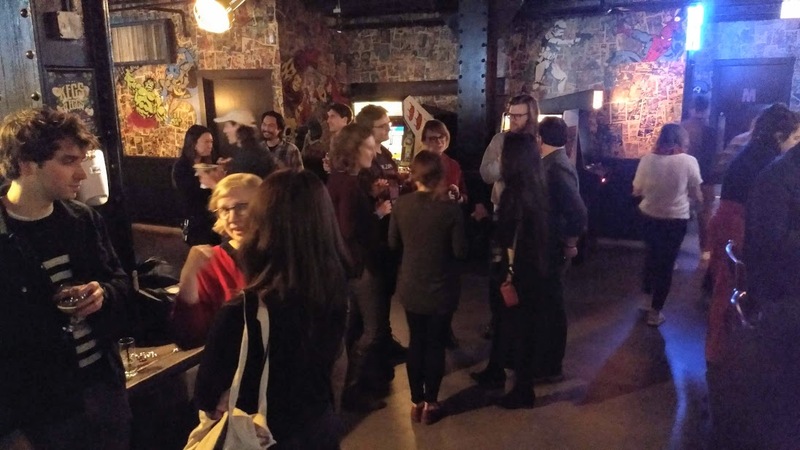 Then I followed up with a less passive-aggressive post about the WGA East, where I documented my failure to get an event in Chicago. 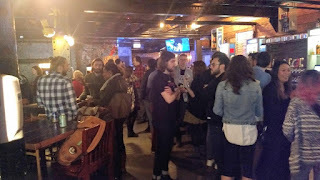 During those two years, I've sent detailed, aggressively whiny emails to the WGA overlords in New York, first getting no response, then eventually getting a response, then actually meeting a couple live human beings who bothered to come here, who were subjected to my venting about how New York-centric that ridiculous union is. So, after several years of having absolutely *no* events in Chicago, we finally had an event tonight. Which makes this day historic: for the first time, the WGA has actually made an effort to leave Manhattan, stop in flyover country, and organize an event, right here in Chicago. It was a social event and celebration of contracts for The Onion and WBBM-TV. I thought some TV people would be there, but there were none, and I have no idea why. But the room was filled with Onion people. First of all, I didn't know The Onion was based here, and I didn't know it employed so many people. And someone told me their office was nearby, so it was easy to get to the bar. Since I was the minority (because I was one of only two people from WBBM Newsradio), I figured that since The Onion is a creative site and they had just had a victory, they'd be friendly and quirky and interesting, especially since we're part of the same union. So I tried to talk to people, with mixed results. I approached one group and asked them what they did, and asked if it would be okay if I took a picture to post here. No dice. They broke apart and gave me uncomfortable sideways glances. So I returned to the two non-Onion people I knew and planned another intervention. 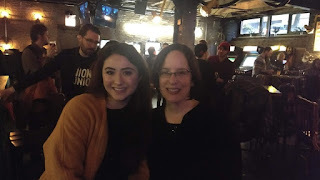 Shereen Mo and I, two of the only WBBM people there (symbolized by the super-bright light above our heads), during a break from my Onion-attempting socialization. The guy behind Shereen is an enthusiastic Onion union guy who[m] I didn't approach because he seemed busy circulating among his Onion compatriots. Surely these creative types would want to meet someone new such as moi, and while I planned my next attempt at peeling the Onion, I took some pictures of the general scene. Hipsters? I report, you decide. I didn't sit at that empty table or anywhere else for that matter. And is a knit cap a hipster thing? 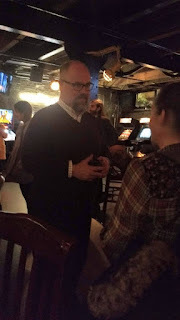 I took random pictures while the Onion groups seemed self-conscious and avoidant, though I managed to have a couple brief conversations with people who managed to segue away. One of many Onion clusters at the event. I may have scared off one of these women when I intensely complained about union dues and bad wages, but the guy in the white hat marks a bit of foreshadowing. I retreated once again, returning to the two people I knew, one of whom was someone I'd just gotten to know after sending him combative emails and having a one-hour conversation the previous day about various issues (thus I've calmed down, don't worry). He also happened to be one of two people I was consistently able to talk to, which made the event seem less like a high school cafeteria. Chris Aiken from the WGA, the person who was ready to talk whenever, creating a welcome space in the midst of a bunch of people whose tribe was theirs. Eventually, after being one of only two people from WBBM, a third person showed up, news writer Mark Friedman. 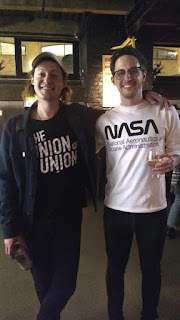 After I chatted with him a bit, I told him I was going to make another attempt to engage Onion folk in conversation, and something actually happened...I met two people who were friendly and wanted to talk, in spite of the fact that I was outside their orbit. Joshua and Bryan: glad to participate. Joshua Patterson and Bryan Petcoff are producers at The Onion, and I had a great time talking with them. After Bryan left to tend to his dog, I talked to Joshua for a while about how great Chicago is, his hometown, Burbank, California, his interests and pursuits, including Feeltrip Records. Thus I did end up meeting someone who positively confirmed The Onion image, and talking to him about his life in Chicago reminded me of what the city was several years ago: a place to do lots of creative things and to explore while not spending a ton to live. 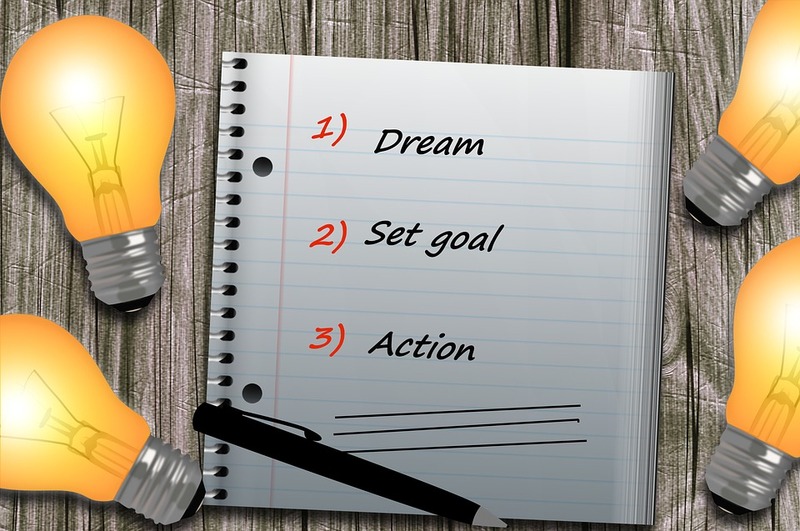 Today is a day to make your dreams come true, because that's what this day officially is (or fake-officially)...Make Your Dream Come True Day! A corporate-type representation of what we are celebrating, which reminds me of blogs that are written for businesses, not fun, such as this one. Like some other strong souls in the media biz, I celebrated the new year working, but took time out between days to go to Steve and Johnnie's first New Year's Eve show in the new WGN Studios. Johnnie Putman with "The 3 C's," aka North Shore teens who perform country music, and Ronnie Rice (right). Note the time, which meant sleep deprivation between work days. And I think everyone except Johnnie are Evanston-oriented, including moi. Steve King after the fantastic fireworks that we saw right outside the window. 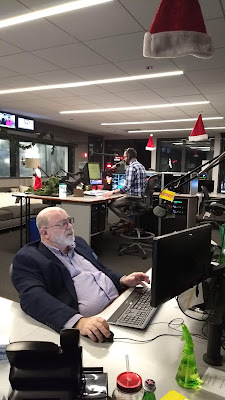 Roger Badesch editing audio while Vic Vaughn is reporting news...note the on-air light in the vast Santa-hatted newsroom. 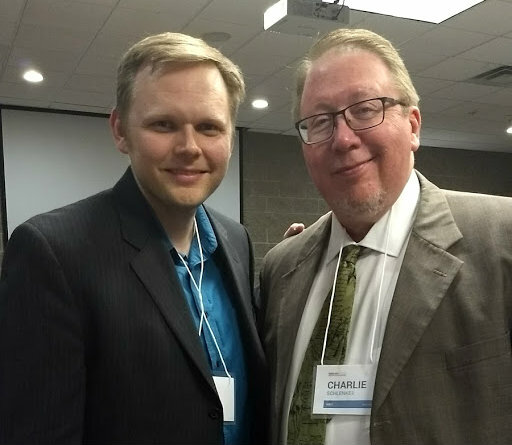 Other than working a lot in general, I made the time to finally put together a fresh pod: an interview with former Sun-Times reporter and current journalism professor Charlie Wheeler, who is a very interesting guy who knows a ton about Illinois politics and Springfield drama. I met him at the Illinois News Broadcasters Association and talked to him for a long time. But don't worry...the interview wasn't as long as our offline conversation. And finally, a public service announcement: please watch the Lifetime documentary "Surviving R. Kelly." You don't have to like his music (as I don't) or even care about such culture, but what was allegedly happening in our backyard is quite ghastly. Also be sure to follow Jim DeRogatis on Twitter, who has done an excellent job reporting about the situation for several years (I don't know the guy, just respect him a ton for bravely speaking out when many wouldn't). Happy Elephant Appreciation Day! In some places, such as Thailand, elephants are popular and useful, and tourists like to ride them as well. 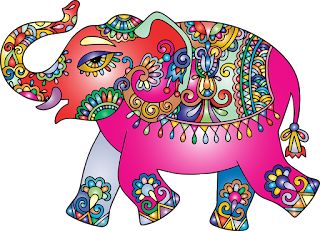 Chicago doesn't have such an option, so I'll just post a decorative representation of one (since I haven't been to the zoo lately). 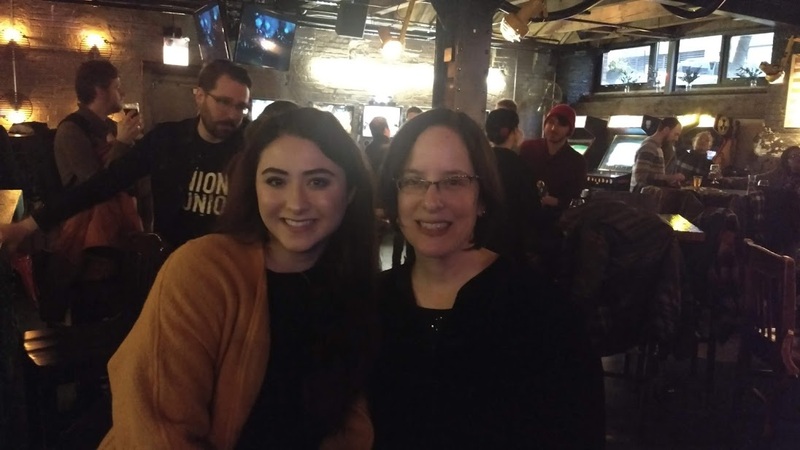 But I have much better and more legit pictures from the media world, because I was one of the few Chicagoans who made the trek to Springfield to attend the fall INBA (Illinois News Broadcasters Association) conference. 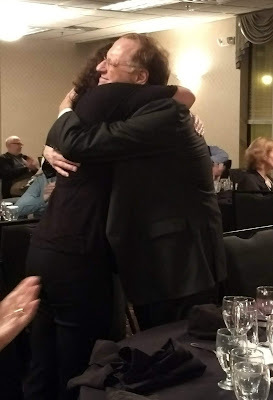 I actually took the train, and at Union Station early in the morning, I saw former WLS Radio and current WCBS star Steve Scott (who[m] I've interviewed), who facilitated several seminars, even the auction, which benefits journalism students. Those are train tickets, which my husband was bidding on, the timing of which wasn't planned btw. And I don't know why the light is so bright. Another notable moment during the auction was when Rachel Lippmann, Reporter at KWMU Public Radio in St. Louis, won a book in the auction and then gave it to WBBM reporter Bob Roberts (another news guy I've interviewed), who was attending his last INBA conference (after doing a ton of stuff for the INBA for like 20 years) as a board member. A random journalist is clapping, Bob is on the right, and the lights are bright again for some reason. 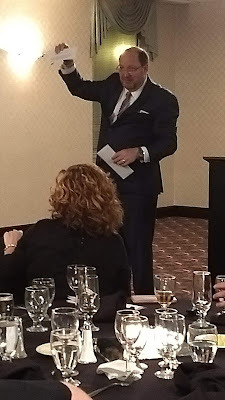 The keynote speaker was John O'Connor, Political Writer for the Associated Press. Here he is (left) relaxing after his FOIA speech with Molly Jirasek, Assistant News Director at WEEK/HOI ABC-TV (who will probably work in Chicago eventually), and Bob. John seemed quite serious about doing big-time work. And speaking of news reporting, I did an interview with the excellent radio news reporter Ryan Burrow, who's at WGN Radio and ABC Radio. Listen at this link. But you might be thinking, "Who cares about news and news people?" Well, I have a decent response to that because I did a very interesting interview with lightning-rod sports guy Mike North. He was on The Score/WSCR for years and started doing digital with the failed Chicago Sports Webio...remember that? He actually talked about it (which he really hasn't talked about before) and much more. So skip the news and listen about the sports scene from a guy who isn't known for being reserved. I'm still thinking about it because he really talked about a lot and seemed very friendly. If you're planning on going to the bank on Monday, you're outta luck, because it's a banking holiday in Scotland. 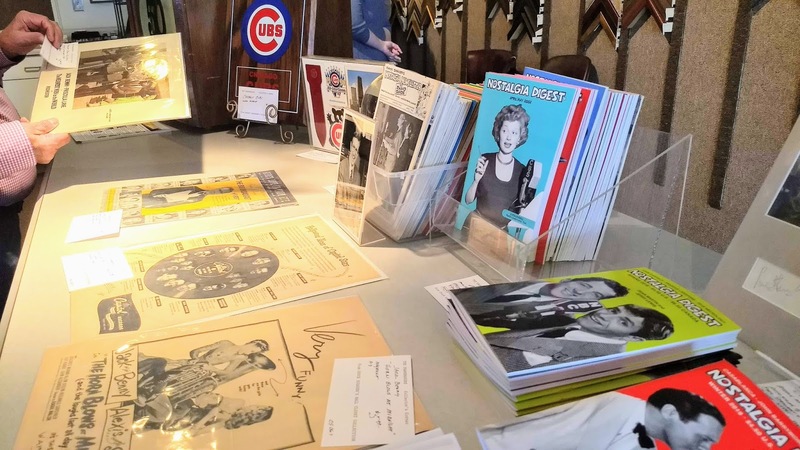 If you're not in Scotland but are in Chicago, or are interested in some Chicago-related media nerdiness, you're in luck, because I have some pictures. A glimpse of its modernity is on the right. Believe me, I really went inside. 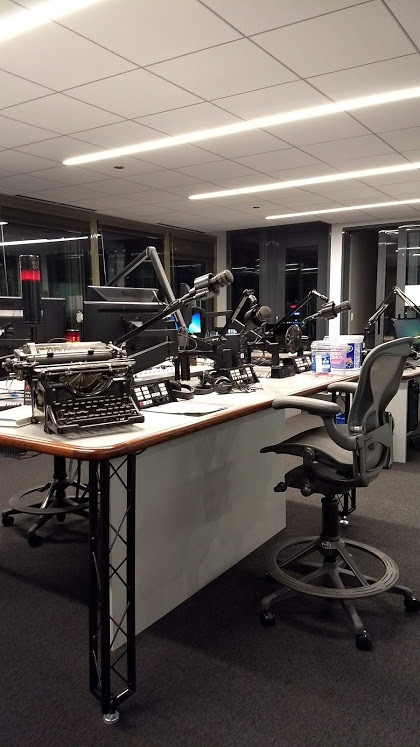 And speaking of fancy coffee machines, I saw the latest at the new WGN Radio home, which is also sleek and modern, though not at the same level as the Trib (not knocking the radio station, but it's simpler). Luckily, they seemed to not mind if I took a couple pictures. WGN newsroom late at night. I don't know why this is vertical. But note the old typewriter. Andrea Darlas and Patti Vasquez on the air in the brand new studios. I was at WGN on a mission: to interview traffic reporter, on-air sidekick, and occasional on-air host, Esmeralda Leon. I had a fantastic time, and I could've easily stayed all night, but I had a non-radio job to go to early the next morning. Plus I had to do my French homework for a class that took up a lot of time, which is why I haven't posted here in a while. But I got an "A" in the class, so it was worthwhile. And résumé-worthy. 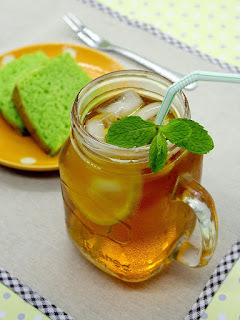 Are you hot? 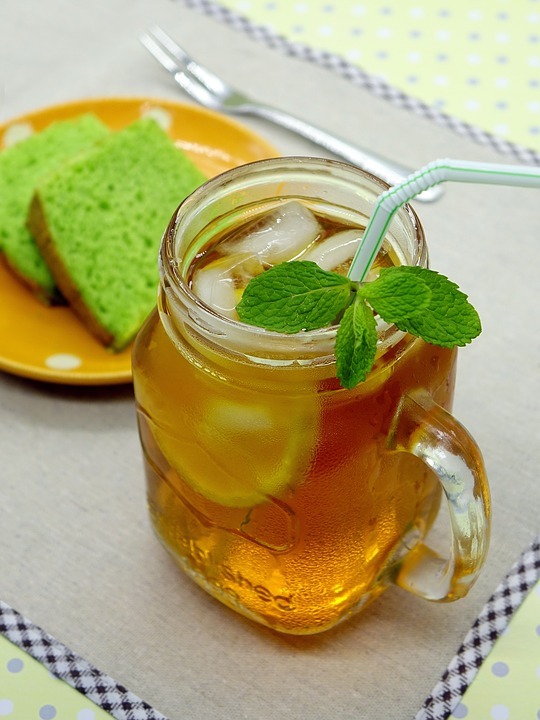 Well have an iced tea, because today is National Iced Tea Day! There's also still time to hang out in Andersonville, where I will be volunteering for Midsommarfest...stop by the beer tent to say hello! I hope that green snack doesn't have some weird dye, or mold, or whatever. 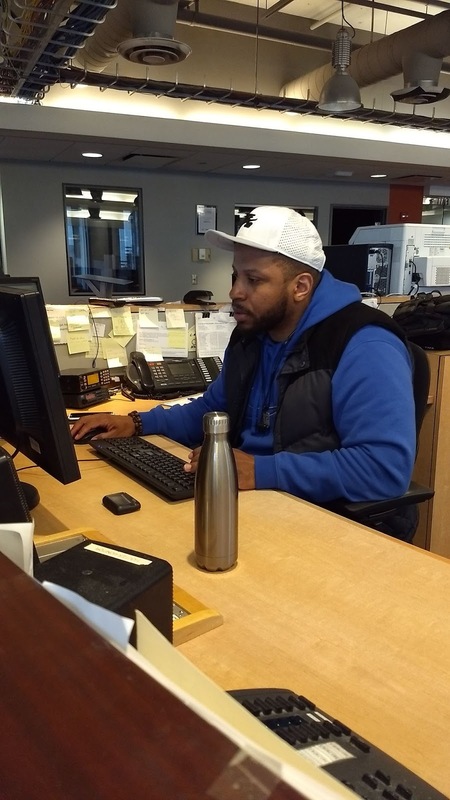 Major congratulations goes to Faruq Basir, who is now full-time at iHeart Radio's Total Traffic Network, where he will continue to be on the air at WGCI, KISS-FM, and WLIT and continue to produce. He also is an editor at WBBM Newsradio, so he's quite busy. 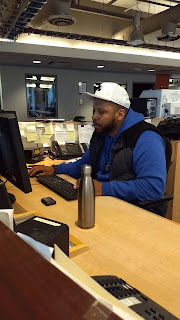 Faruq Basir in charge of the newsroom late at night. 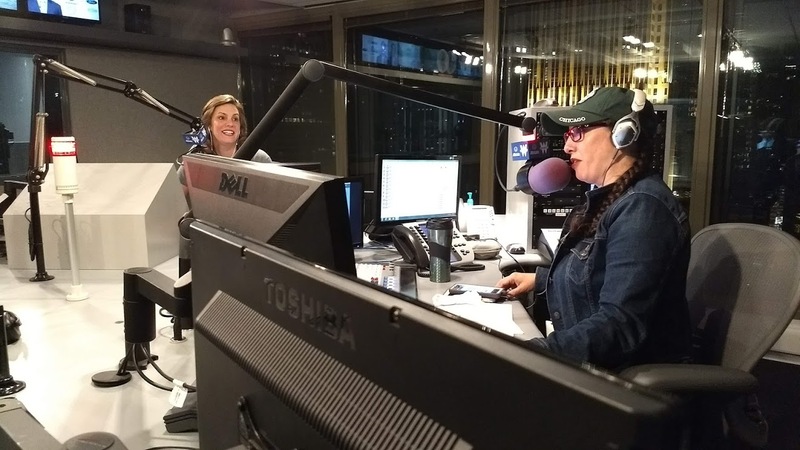 And this just in: Rick Gieser's (who[m] I interviewed) son is going to be on Patti Vasquez's show on WGN (I'm assuming in the new studio) on Monday night at 11:30, so tune in to hear him talk about his passion, bees. And in case you went to the WLS website and saw that Stephanie Trussell has a show on Saturdays from 1-3 pm, that would be wrong...they haven't updated the site, but she's now on the air from 3-6 pm on Saturdays. I highly recommend her interview with Larry Elder, who talks about the hardships his father faced, in addition to their strained relationship. And speaking of interviews...I've just posted my latest one with John Siuntres, who's worked at several radio stations, including WSCR The Score in its early days, Hubbard Radio, WBBM...and is one of the *pioneers* of podcasting. He started his podcast, Word Balloon, in 2005, which is when podcasting was in its infancy. He's pretty much the only person I have met who was there when it all started, and his podcast has become very popular, with sponsors and thousands of listeners. The interview also includes samples of his voice and production work. I think it's a compelling interview, and I was very glad to talk to a long-time, established, successful podcaster. Today is the last day of the Illinois News Broadcasters Association conference in East Peoria, and I've had such a great time, I want to go to the next conference in the fall. A lot of people assume it's for newbies, but I have learned so much and feel really energized and motivated to keep doing stuff and staying on track. One person who totally made the conference worth the trip is ​Ryan Denham, Digital Content Director at WGLT Radio. He did an amazing presentation about creating compelling digital stories. Every single person who creates digital content, not just news people, could apply what he talked about. Actually, when I asked a seasoned pro why more people don't join the INBA, he said it's because they say they already know what's needed. It was clear that what Ryan was talking about is not practiced by those pros, and he really should be speaking to all kinds of content-creating groups. He also deservingly [don't know if that's a legitimate word] won a couple AP awards. btw--WGLT is at Illinois State University in Normal. 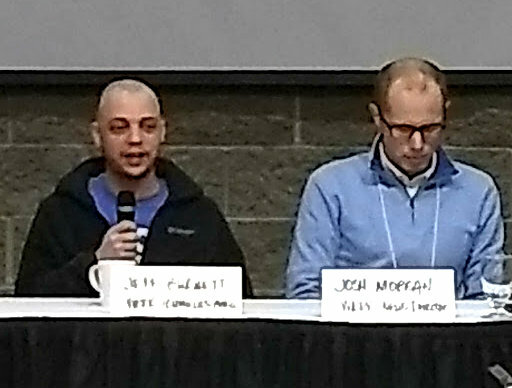 Also, what's happening right now (I'm obnoxiously typing during a conference session) is that WEEK-TV (in Peoria) producer Jeff Burnett (who's also on the air at WBWN Radio and is also one of my supportive podcast listeners) is speaking about working in small markets. There are actually people who don't care about going to Chicago, or they end up not caring once they find their niche in a smaller market. He's presenting with WREX (in Rockford) News Director Josh Morgan and WMBD-WYZZ Meteorologist Brooke Brighton (who weirdly didn't show up in the photo, but I don't have time to solve that problem). Now back to my offline life, though I won't be eating jelly beans despite it being National Jelly Bean Day. A modest selection to represent today. Greetings from East Peoria, where I'm at the Illinois News Broadcasters Association spring convention! I ended up joining the organization late last year when board member Jeff Burnett (who[m] I will meet in-person for the first time) asked if I was interested in signing up. I figured, why not? And here I am! So far, people seem very friendly, and I didn't realize how badly I needed to get out of Chicago to be able to relax and reflect. Here are a couple of people I met who work far away from Chicago, all the way in Champaign–Urbana at WILL Radio: Steve Morck, who's a host and producer (left), and Brian Moline, who's the Morning Edition host and Managing Editor. They seem really friendly and are very content with what they're doing...and busy. Seems like that public radio station is doing lots of interesting stuff and is expanding...which is rare in the radio world! They had no idea about my podcast...guess it doesn't play in Peoria. 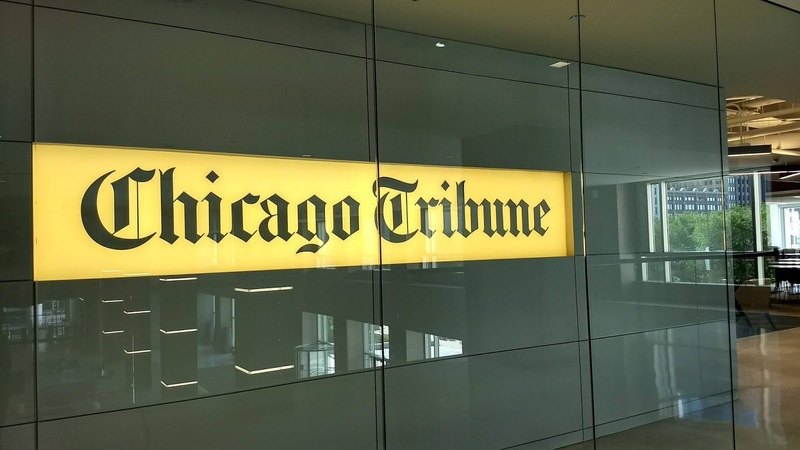 In other journalism-related news, here's a writer who you'll probably be seeing a lot more of, not just around Chicago, but throughout the nation: Joe Ward, who has written some stories for The Reader. One notable article he's written is "A Chicago cop’s daughter’s suicide sets family on mission," which is the kind of long-form writing that is not my strong suit, which is why what he's doing is so admirable. 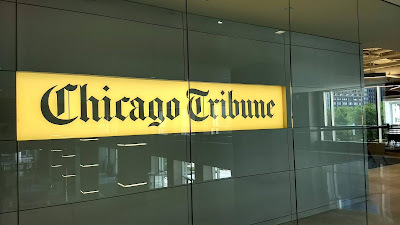 And the final journalism-related story (I'm successfully being consistent, apparently) is that I interviewed City Hall reporter and Political Editor Craig Dellimore, who has the kind of job at WBBM Newsradio that lots of people in the INBA and beyond would probably want. All right, back to my East Peoria adventure...stay tuned. Long time no see/write! In addition to working, I spent several weeks dealing with a very badly dented car (scroll down for photo), thanks to someone who crashed into me in a parking garage. 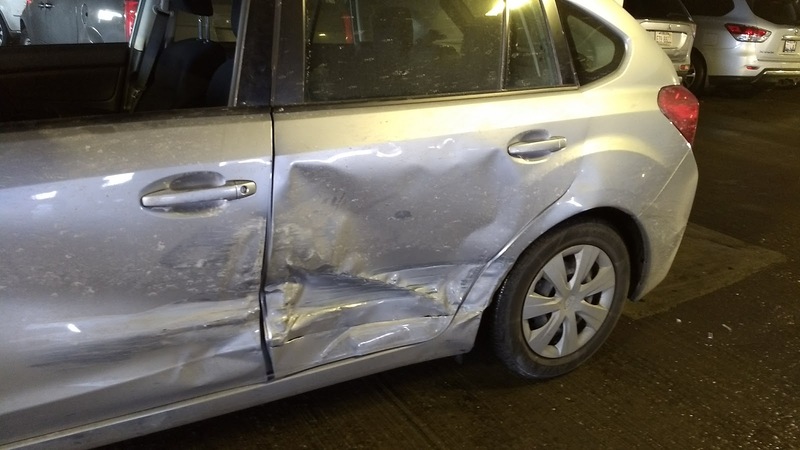 It wasn't a matter of simply calling their insurance company and taking it in to the body shop to be fixed; there were mini battles and obstacles along the way, including on the last day when I finally got my car back. There are too many details to bore you with (if you see me elsewhere, I'll describe that "ordeal" if you want). But it became a kind of mini-hobby, in addition to one of my more official ones...volunteering at the Swedish American Museum. Why do I mention this? 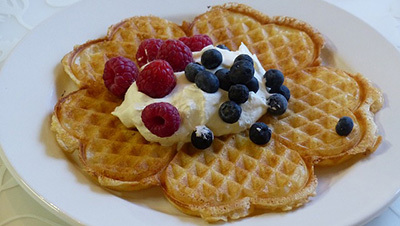 Because today is Våffeldagen, aka Waffle Day. I've noticed the Swedes enjoy treats and relaxation, and the holiday season provides a valid excuse to enjoy life even more. 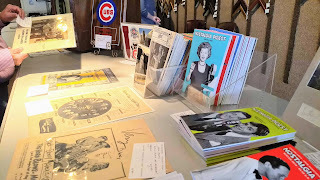 So if you're in Andersonville today, go to the museum to eat waffles! I am actually helping out a bit before I close out the night at my radio job, so I might see you there! because my Swedish is still quite awful. Also today (or technically, tonight), Christopher Robling will be guest-hosting the "Beyond the Beltway" show from 6-8 pm. Mr. Robling is a very understanding person because one time I bluntly told him that his political analysis was off, and he didn't hate me for it (that's the risk of often having to be silent...I'm not allowed to express myself, so I sometimes blurt stuff out to kind people like him). Time now for a public service announcement: Caitlin Fry, a writer/pro communicator who was at WGN Radio before moving out West, has a great blog post about a failed company that was initially celebrated on TV and had been giving her a hard time. I remember when blogs were pretty much mocked and derided by journalists in the early days before those pros jumped on the bandwagon. Now it's more difficult to find lengthy, heartfelt blog posts due to the proliferation of social media, but Caitlin does offer such a style, as in the days of yore. (btw--I'm not naming the company because their response to her seemed frightening, and I don't want to incur their alleged wrath either). 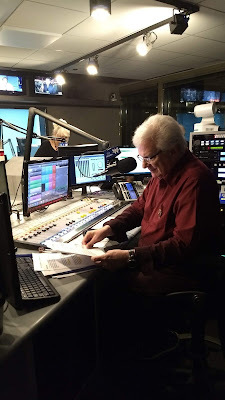 Another notable blog post (I love blogs, so if you have a good one, let me know) is from radio/media fan (and digital content pro) Martin Hawrysko about the White Sox on WGN Radio. I am *very* glad they made it to 720, but the style is still...well, it hasn't changed. I'll let Martin explain. And speaking of sports and the White Sox...my latest pod interview is with Rey Diaz, who works on the morning and midday shows at The Score (former home of the White Sox). He's one of the most decent guys I've met in radio, especially sports radio, and he's also an interesting guy. Listen to the interview here. My car...a Valentine's Day crumple at Northwestern. Yay.